Camps Bay, a premier holiday destination is a village found nestling on the Atlantic coastline between Clifton and Bakoven. It is built on the slopes of the Twelve Apostle's mountain range where there are twelve peaks named after the Apostles of Christ and stretches down into the valley till it reaches the sea. The village is named after a Fredrick Ernst Von Kamptz who lived on the farm Ravensteyn in the area during the late 1770's. Von Kamptz was originally a sailor and when he arrived in Cape Town he met and married the daughter of the original owner of the land. The village boasts a number of older buildings and one of them is the Rotunda which was built in 1904 and today forms part of the Bay Hotel complex. In its heyday the Rotunda was used for dancing, roller skating, silent movie shows, boxing and other sporting events. Today the Rotunda's high-ceiling still allows the building to be used for a a wide variety of functions which include events such as product launches, cocktail parties, fashion shows, weddings, barmitzvahs, banquets and dinner dances. The Rotunda is also a popular venue for conferences with the Bay Hotel being situated just a few metres from Camps Bay's spectacular beach. 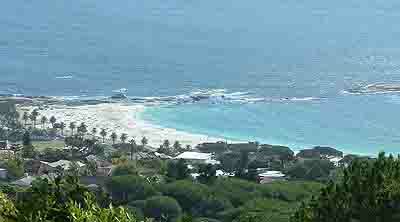 Camps Bay beach is very safe, good for swimming, tanning and other activities such as surfing and beach volleyball. Every year a volley ball tournament is held on the beach and attracts many visitors . Film crews from all over the world are often seen filming on the beach and scenes from the TV movie Poseidon Adventure were shot here. At the southern end of the beach is a natural pool with safe swimming for young children. On weekends and during the summer months the lawns on the beach front are crammed full of people enjoying picnics and the sun. The road which links Cape Town with Hout Bay runs through Camps Bay along the beachfront and was built way back in the 1880's by Thomas Bain using convict labour. It was named Victoria Road in honour of Queen Victoria�s jubilee in 1888. It is still the main road along the Atlantic coastline today. Opposite the beach are a number of shops and restaurants which form part of the hotel complex and are a hive of activity over weekends when sunbathers flock to Camps Bay. Towering over Camps Bay to the north is the spectacular Lion's Head with its deep valleys and expensive hotels, houses and flats clinging to the mountain slope like limpets to a rock. All of them are engineering marvels in their own right hence the high price tags they demand. Camps Bay is known as the Riviera of the Cape and attracts the beautiful people of this world. The village is a picture when viewed from above with its white beaches and blue azure sea. It's all very well having scenic beauty and beaches but what else does the village have to offer its visitors. A short distance from the Bay Hotel is a quaint little theatre named the Theatre on the Bay which was built in 1899 and was originally a power station. It is well known and loved by theatre goers in Cape Town. To the east towering above Camps Bay is Table Mountain with its the cable car ferrying passengers up and down the mountain. 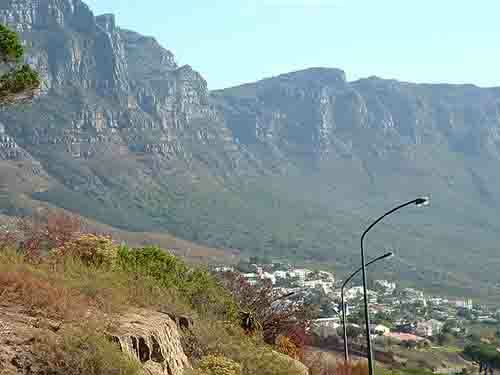 On the lower slopes of the mountain starting at the entrance to Tafelberg Road is a track which follows the old water pipes along the mountainside above Camps Bay. It's called the Pipe track and has spectacular views down over the village. Leading off the Pipe track is a trail known as Kasteelspoort which takes you to the top of the mountain. 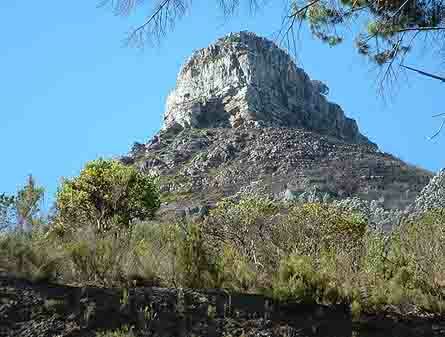 This is the only track on the Camps Bay side of the mountain leading to the top of the mountain. It's a strenuous climb and is not suitable for unfit people. Lion's Head on the other side of Camps Bay Drive opposite the Pipe track is a better option for the not so fit. The climb is reasonably steep and not too difficult. After making the effort to climb to the top you will be rewarded by the spectacular views out over Cape Town and Table Bay. Many people make the climb in the late afternoon when it starts cooling down and reach the top just in time to see the sun set into the Atlantic Ocean. It's then quite a scramble to get down the mountain before it gets dark. For those who like to walk there is a lovely non strenuous walk along the beach at Camps Bay to the beaches at Clifton and from there through Bantry Bay and down onto the Sea Point promenade which will eventually lead you into the V & A Waterfront if you choose to walk that far. It's a scenic walk all along the coastline and is quite safe during day light hours. Camps Bay is a delightful village to visit especially if you have the time to lie in the sun and enjoy its beaches. Visit us soon, we would love to see you here.